In Chicago, Roxie Hart is the main character who ends up at Cook County Jail for murdering her lover. Portrayed by Renee Zellweger in the film adaptation, Roxie is an aspiring singer and showgirl who finds fame and stardom during her jail time. To distinguish her from her villainous rival, Velma, she is blonde and frequently seen in white costumes, which contrast will Velma’s dark hair and black costumes. Amos Hart is the loyal but dimwitted husband of Roxie Hart in the musical, Chicago. 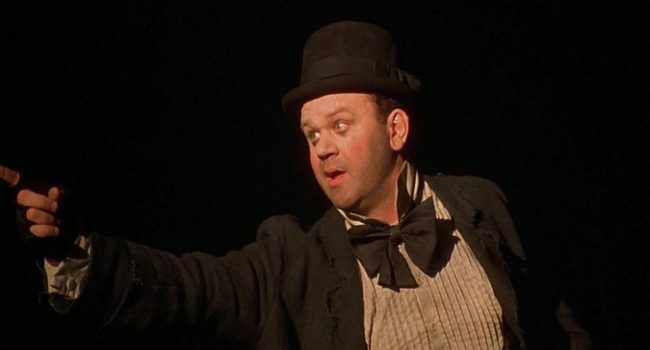 Portrayed by John C. Reilly in the film adaptation, his major musical number, “Mr. Cellophane,” is modeled after vaudeville tramp-clowns, reflecting his put-upon place in the story line. Vaudeville clown suits are difficult to find in black, so to replicate his tattered look, distress an oversized suit or pants and jacket, tie a large, silk scarf into a bow, and use light clown makeup. In Chicago, Mary Sunshine is the sensationalist tabloid report who follows the stories of the women on Cook County Jail’s “Murderesses’ Row.” Portrayed by Christine Baranski in the film adaptation, Mary Sunshine’s costume are in line with what a professional reporter would have worn in the 1920’s. Portrayed by Queen Latifah in the Chicago’s film adaptation, Matron “Mama” Morton is the corrupt matriarch of the Cook County Jail. She takes both Roxie Hart and Velma Kelly under her wing, but also fuels the rivalry between them. Billy Flynn is the smooth-talking, highly-sought lawyer who defends the women of Murderesses’ Row in the musical, Chicago. Portrayed by Richard Gere in the film adaptation, Billy Flynn ignites the feud between Velma and Roxie when he chooses to represent Roxie. Velma Kelly, portrayed by Catherine Zeta-Jones in the hit film, Chicago, is a nightclub singer and vaudevillian who is sent to Cook County Jail for murdering her husband and sister. She finds a rival for stardom when Roxie Hart arrives at the same prison and steals her spotlight.